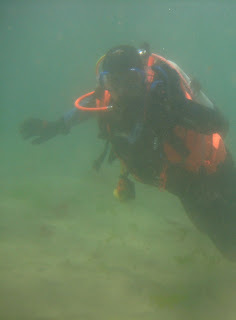 With good British sunshine, comes good British scuba diving. Well, baring the occasional bout of unpredictable sea fog. During my happy jaunts around the Dorset coast one question came to mind that I could not seem to let go of. What would it be like to scuba dive on an alien world? After a number of days struggling with my own PhD work I have turned to this question with an air of relaxation and yet it seems to offer more conundrums than I first thought. We have one fantastic example in our own solar system that offers the details necessary to compute these and a completely alien environment to explore. Titan! Titan is the largest moon of Saturn and it is also has the distinction of having the most Earth like qualities of any planet or moon in our solar system or beyond. Don’t get me wrong there are also a large number of qualities it possesses that make it wholly un-earth-like, but it is those that make it the perfect place to start our journey. The first close up images of titan were taken by the Pioneer space craft in September 1979, and then later by Voyager 1 in 1980 and voyager 2 in ’81, however, these did not have on-board instruments that could penetrate the hazy atmosphere of the moon. I took a specifically designed spacecraft, Cassini-Huygens; that reached Saturn in July 2004 for the process of mapping Titan to begin. High resolution images were taken by Cassini while the Huygens probe made for a landing on the surface of the moon. 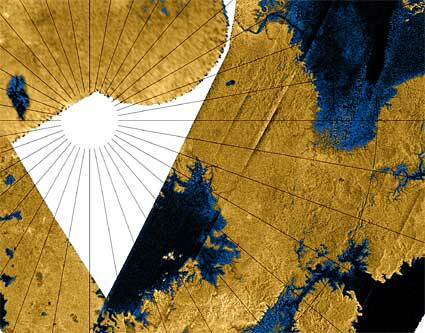 Cassini continued to make close fly-bys of the moon collecting radar imagery of the northern and southern poles. It was these radar images that confirmed the proposed hypothesis that bodies of liquid could form on the surface, like those seen on the Earth. However, it is here that the comparison starts to break down as these lakes are not made of water but liquid methane and other hydrocarbons. In fact there is no liquid water on Titan, in its atmosphere or on the surface; this is due to the fact that it is -178°C and any water that may be on the moon is frozen in rocks. 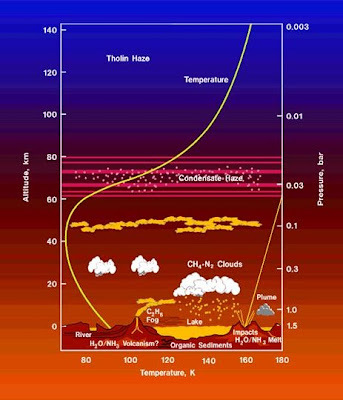 Yet, like the Earth most of Titans atmosphere consists of nitrogen though on Titan the majority of the remaining atmosphere is made up of methane, which can condense and form a liquid. It is thought that due to the relative lack of sunlight at the poles methane can accumulate in seas and lakes, however, in the summer seasons intense methane rainstorms can occur with over 100 times the volume of liquid deposited in an area the equivalent size on the Earth (though these flash floods would only occur once in a decade or century). But what about scuba diving; what would that be like? Titan may be far smaller than the earth but standing on the surface in your scuba gear would not be made any easier by the decreased gravity. This is because the atmosphere of Titan is so dense that the pressure on the surface is 1.45 times that of the Earth. In fact the atmosphere is so dense that if you were to attach wings to your arms you would be able to fly through it under your own power. The spectral images taken by Cassini show that the chemical composition of the lakes can vary, however, most are formed 75% ethane, 10% methane, 7% propane and a series of other heavier hydrocarbons. It was expected that due to the low gravity and detectable surface winds that waves would easily form on the surface, however no evidence has shown this leading scientists to believe that the lakes may be more viscous than expected with tar like qualities. So expect low visibility conditions, in a gloopy custard-like lake. Measurements of Ontario Lacus in the southern hemisphere show that it is extremely shallow with a maximum depth between 2.9 and 7.4 m. So you will be able to spend as long as you like under the surface without having to do any decompression stops. In the northern hemisphere however, Ligeia Mare has depths exceeding 8m (the extent of the radar measurement), and given the long northern winter on Titan means that it could still harbour the tons of methane from the last rainfall. I suggest you do a little fly over to get measurements of the depth before heading into this one. The density of liquid ethane is less than half that of sea water and given the decreased gravity of Titan you will not feel the increased pressure as you go down. In fact to double the atmospheric pressure on Titan you would have to go down to 406m, while on Earth if you go down just 10m you double the atmospheric pressure. This does mean that if you want to get the record for the deepest dive (though I am not sure Guinness world records cover Titan) you will have no trouble dealing with the pressure effects. 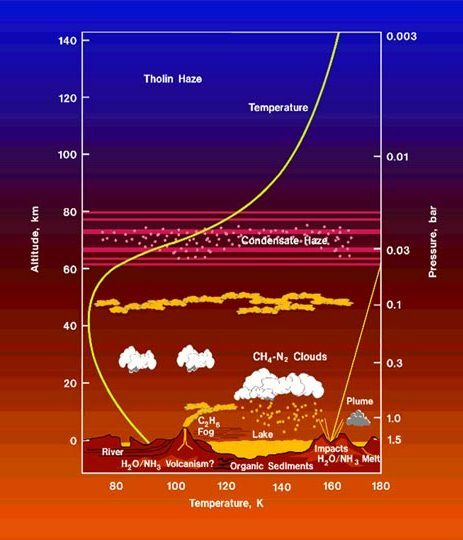 Oh and also remember that the temperature of liquid ethane and methane on Titan is under -89°C and will probably be colder so perhaps just this once you could convince me to dive in an insulated dry suit, but only for this.